Sandwiched between the butchers, the Pound shops and the stinky fish mongers of Dalston, is Ridley Road Market Bar, where I recently stopped in to meet up with glacial drama-pop duo Alpines. The place was rammed with an unfeasibly attractive crowd, dressed up to look dressed down, yet Catherine Pockson and Bob Matthews were easily the most eye-catching pair: Pockson, svelte in a pair of black cigarette pants, all feline eyes and sheeny waist-length hair swept into a tight ponytail, and Matthews cool and dapper in a tasteful tropical shirt. Alpines' output thus far incorporates stuttered, sparse beats and piano moodiness, with songs like "Cocoon" and "Drive" hinged around Pockson's remarkable pipes, fragile, unerring, and in the live setting in particular, arresting in their power. As is perhaps fitting of a former history of art/fashion school student (Pockson) and a European film and world cinema graduate (Matthews), Aplines' videos carry through a sleek, modern visual aesthetic with a twist of gothic romance. 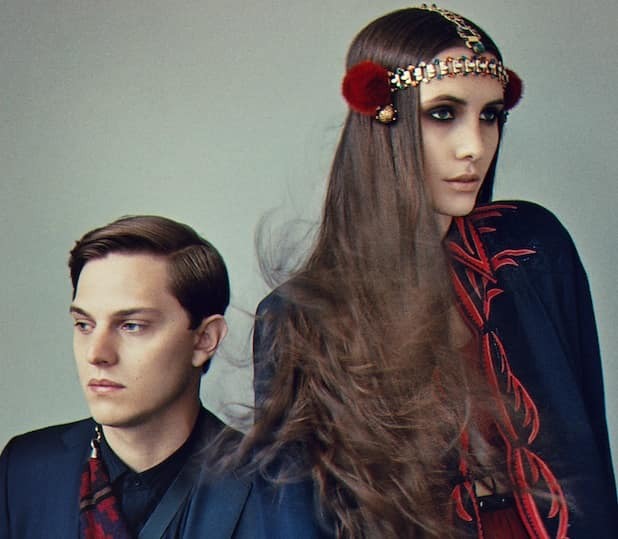 Recently, Alpines caught the ear of Florence and the Machine, who asked the duo to open for them in front of some 10,000 people. Currently in the midst of finessing their debut album recorded with Craig Silvey (Arcade Fire, The Horrors, Arctic Monkeys), Alpines are whittling down the hundreds of songs they're written and, "getting out of their comfort zones," exploring rhythmic textures and a dancier, soul-inflected influences with an excellent brace of producers including Craze & Hoax, Maya Jane Coles and Dark Sky. Below, read my interview with the group and listen to their new single, "Empire," which they describe as "a kick in the balls." You guys met at a wedding. Did you have an inebriated moment on the dancefloor? BOB MATTHEWS: It wasn’t a cheesy wedding, it was quite a cool wedding. I was in another band before this one and it was the drummer’s sister who was getting married, so we were the wedding band. I went to see Catherine play the next day and I thought she was amazing. Pretty soon after that we just started making music. After a while it just superseded what we were doing in our other acts. I'm obsessed with your hair. Have you ever cut it? CATHERINE POCKSON: No, it’s always been long. Always. I hate getting my hair cut because I have to stand up for half an hour while it's cut and it’s hard to stand really straight so sometimes it can turn out slightly lopsided. I blame my mum because she was always like, “If you cut your hair, I’m kicking you out. Your hair is gonna be a thing.” I kind of went along with it. How did you both end up becoming a muse for designer Dominic Jones' last collection? POCKSON: We played at London Fashion Week when he had his presentation and that collection was really important for him because he was the first jeweller to ever present at LFW, it was a real honour. And then there was Florence [Welch] and Orlando Weeks [of The Maccabees] and a whole host of amazing people who we’re really inspired by, featuring in that collection. You're in the process of pulling the record together. Have you noticed any themes emerging? POCKSON: If I run through the album in my head as the track list currently stands, it starts with a song called "Odysseia", which is about The Odyssey and about travelling and journeying, and it ends on a song called "Lights" which is about fighting through dark times and reaching a lighter place. A lot of my writing comes from a combination of my experiences and other people’s. I like having lots of different themes, it’s like reading a book, you want it to flow through different chapters. That’s what I wanted with a debut album. When did you realize you could sing? MATTHEWS: Catherine was born singing. POCKSON: I popped out of the womb, top C, no problems! I loved writing poetry, when I was about 11, I was a bit of an emo kid and one day I just decided to take a poem and make it into a song on piano. That’s when I started to teach myself piano and just do everything by ear. I joined a gospel choir at school and I realized this was something I really love and it comes naturally. I’ve always done it as my thing, but even up until the end of uni I never thought, This is what I’m gonna do, because it was just the thing I always did.